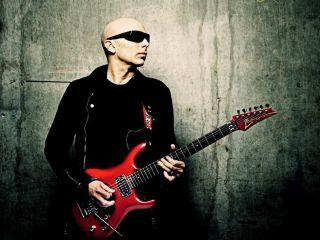 Joe Satriani's lawyer: "We hope Joe's song wins at Grammys"
Until now, it looked as though major drama could unfold at this Sunday's Grammy Awards, with Joe Satriani's legal team threatening to serve Coldplay with papers in the lawsuit he has brought against them pertaining to their song Viva La Vida, which he claims infringes on the melody to his song If I Could Fly. "All of that has been averted now," says Howard King, Satriani's attorney, speaking exclusively to MusicRadar. "Coldplay have hired one of the finest entertainment firms in California, which is probably good for all." "Their new firm will have a keen understanding of the strengths and weaknesses of the claims," says King, "and will counsel the band to come to a quick and fair resolution of the situation." It could have gone another way, however, says King. Until very recently, Coldplay did their best to brush off Joe Satriani's claims of plagiarism. "We tried to have a conversation with Coldplay before we even filed the suit," says King. "Their British lawyers said there wasn't anything to discuss. And then after we filed the lawsuit, they didn't agree to accept service of the complaint." As King explains it, "You have to hand someone legal papers in order for matters to proceed - much like in a divorce, you have to be served." As of two weeks ago, Coldplay's UK law firm still hadn't accepted the service of complaint, and that's when King said, "Enough. If that's the way they want it, we'll serve the band in California when they're here for the Grammys." According to King, arrangements were made to serve Coldplay at parties and various locations in California. "We knew where they were going to be at," he says. "And if all else failed, if they didn't accept the papers, we would have had no choice than to take care of matters at the Grammys." While King doesn't come right out and say that this week's publicity surrounding the lawsuit forced Coldplay to hire a US attorney, he does admit that it's "somewhat coincidental. Who would want to be hit with legal papers on the red carpet?" And what does King think of Coldplay's chances of winning on Grammy night? "We hope Joe Satriani's song wins a Grammy," he says with a laugh. "In fact, we hope Joe has a very big Grammy night!"